Remember the George and Martha series? And that one about the split pea soup? Of course that’s the one I recall best–I was a foodie even before I could make sense of the print in the story book. 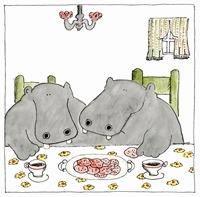 This tale depicts the hippo couple (“friends,” the book series insists, though I’m convinced they’ve worked in some benefits) facing an existential question: How much can you really like split pea soup? George assumes Martha likes to make the stuff, while Martha thinks George just adores eating it. So Martha cooks up batch after batch and George good-naturedly puts it away. Each thinks they’re doing the other a big favor. In reality, Martha does not enjoy her side of the soupy partnership, and neither does George. The whole thing comes to a head when Martha catches her pal pouring a bowl into his shoe. Enlightenment ensues. This story teaches a lot about watching out for your own interests, communicating, and not letting niceness get the best of you. However, it neglects to point out that split pea soup can be fun both to make and to eat, especially when the air takes on a fall chill and the season offers a host of produce that cries out for legume stews. (It doesn’t hurt if you need to put off writing a short story, revising an article, or crafting a model syllabus). I made my first pot of split pea soup the other day, flavoring it with just sauteed diced onion and cubed sunshine squash. Here’s the recipe. I’d love if you’d try it, but don’t feel obligated on my account. Sort through the split peas and remove any stones or odd-looking peas. Add enough water to cover by a few inches and let soak for a few hours or overnight. You can skip this step, if you want, and just simmer the split peas longer. When you’re ready to cook, heat the oil on medium-high in a large saucepan or pot. When hot, add the onions and saute, stirring frequently, for a few minutes. Meanwhile, drain the split peas and measure out about 4 cups of water. When the onions have browned a bit and have started to become translucent, add the split peas, water, and salt. Cover and bring to a boil. Reduce heat and simmer for 30-60 minutes, stirring occasionally, until the split peas have started to fall apart. While the split peas are simmering, cook your squash in a separate pot. (You can also try simmering the squash with the split peas, but I like to play it safe. You never know how long the squash will take, and you don’t want either too raw or too mushy squash entangled in your soup). I recommend steaming over an inch or so of water. Check for tenderness after 5 or 8 minutes and continue to cook, if necessary, until squash is just tender. Remove from heat and set aside. When split peas are ready, puree the soup if you wish in a blender or food processor (or by using your hand blender!) Stir in the squash, water and all, and then adjust the seasonings. The flavor will develop in the hours after you cook the soup. Go easy on the seasonings at first, and taste again later on. This is a really basic recipe that you can feel free to spice up. You can do this by adding fresh or dried chilies, curry powder, other cubed veggies, Parmesan cheese, fried veggie bologna or tempeh, fresh or dried sage or other herbs, and so on. If you do anything exciting, let me know about it! I recommend serving this soup piping hot with crusty garlic bread for dipping. ahhh! i love george and martha!!! this post brought back wonderful memories!! thanks baby! I know! They’re the best.